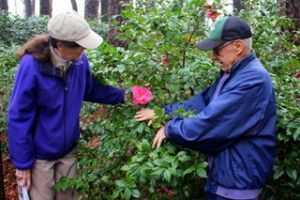 Early on a cool, damp morning last week, I met Ron and Belinda Jacob at the Savannah Botanical Gardens on Eisenhower Avenue. The fog had crept in on little camellia feet. We were alone there, whispering in the quiet mist, with only the clear call of a tufted titmouse echoing from the bare trees. 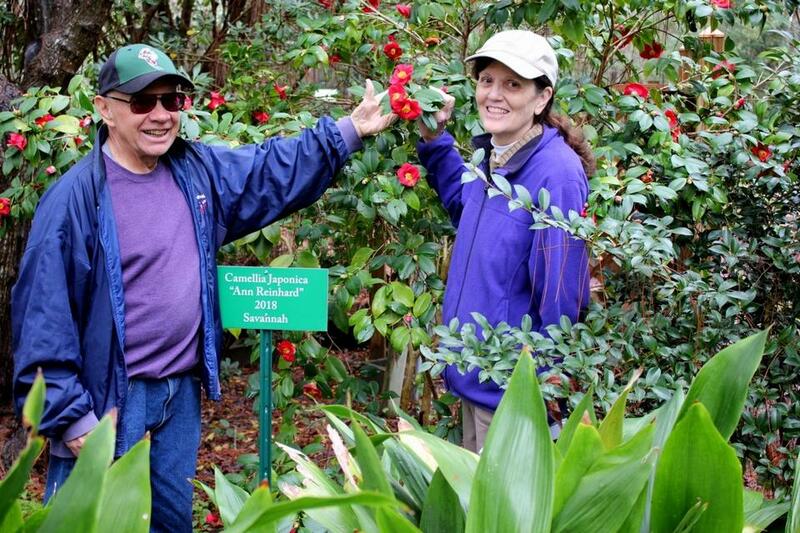 The Jacobs were leading me to see the Ann Reinhard, a camellia that grows only in the Savannah Botanical Gardens. Against its dark green leaves, its red blossoms seemed to cascade like a haunting flurry of poppies on Armistice Day. 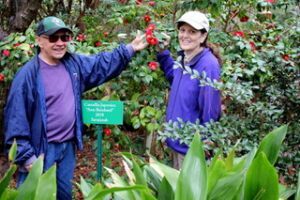 The camellia was discovered growing in the Savannah Botanical Gardens some 20 years ago, but until it flowered, no one knew what variety it might be. 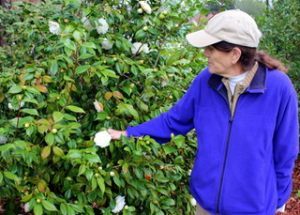 Last February it bloomed, and local camellia expert Gene Phillips determined it was a hitherto unknown variety. It is what is called a “chance seedling,” a plant that has come from a natural pollination, a seed formed by serendipity. On some past warm winter day, the right encounter of a bee carrying pollen from the anther of one flower to the pistil of another started the Ann Reinhard life cycle. 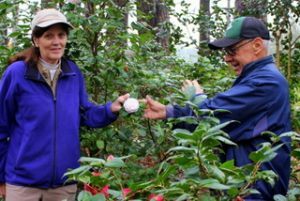 The Jacobs and the staff of the Savannah Botanical Gardens began the process of submitting the previously unnamed camellia for inclusion in the national Camellia Registry. They cast about for an appropriate name, when everyone seemed to have the same thought at once to name it in honor of Ann Reinhard. The beautiful circa-1840 German-vernacular building that sits on the edge of the 10-acre Savannah Botanical Gardens is named the Reinhard House. It first stood on the Reinhard Farm near Wheaton Street downtown. Indeed, eight acres of the farm were purchased in 1853 to become the Catholic Cemetery. The house was slated for demolition to make way for the Truman Parkway. It was saved and moved in 1992 by the Savannah Area Council of Garden Clubs. It now serves as the SACGC headquarters and as the information center for the Gardens. A year ago, I saw the Ann Reinhard at the Jacobs’ invitation. She had only a few blooms then, but she is covered with flowers now. 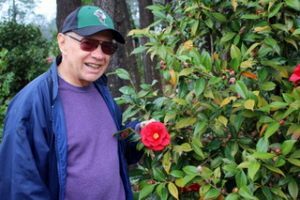 Ron said the bitter winter of 2018 seems to have caused Savannah’s camellias to rebound mightily this year. He was captivated from the beginning with the simplicity and elegance of the Ann Reinhard’s single (one row of petals) blossoms. 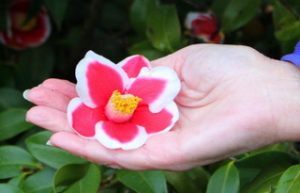 Camellias originated in Japan, where simplicity is valued aesthetically. 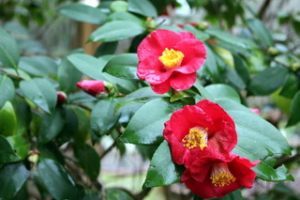 Indeed a small, red, single camellia can be seen at Magnolia Gardens in Charleston, where it was imported from Japan in the 1700s. 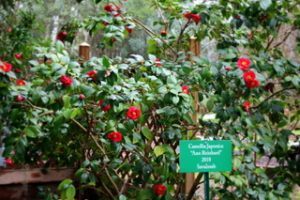 The Savannah Botanical Gardens have 67 varieties of camellias, all but one identified. The Jacobs took me on a magical tour of singles, doubles, anemone forms, peony forms, rose forms, formal doubles — an enchanted walk, close to nature, next to Hospice House. We visited the Tama-no-ura variety, a red-and-white single, similar to the Ann Reinhard. It was found in the wild on an island of the Nagasaki Prefecture in 1947 by a charcoal burner. With its white edging and golden stamen tops, one bloom seemed to float above the palm of Belinda’s hand. The fluffy rose-pink blooms of the R.L. Wheeler variety hovered over a lush stand of azaleas. The Jacobs knew it originated in Macon in 1949. They showed me the reticulata hybrid Crimson Candles, its dew-covered rose-pink petals resembling a music-box ballerina. I was struck by the Charlean, with large, pink-orchid petals and airy pinkish filaments. 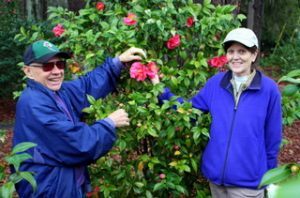 Ron pointed out that there is a story behind every camellia, and Belinda said they had met the flower’s namesake. The woman Charlean is the granddaughter of the originator, William Stewart of Savannah. Ron showed me the Betty Sheffield with its loose peony form. It is whitish with blotches of red and pink and is noted for “sporting,” where different colors appear on the same plant. Like the Ann Reinhard, it was a chance seedling from Quitman found in 1949. Our camellia journey took us to the majestic white Sea Foam, which originated in Fernandina Beach, the fluffy High Society from Albany, the luxurious Royal Velvet from California. 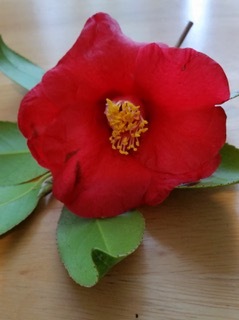 The Jacobs knew the names of every camellia we passed. They knew the legacy carried in those names. They knew the ethereal beauty. They themselves helped name the Ann Reinhard, who passed away in the 1800s. 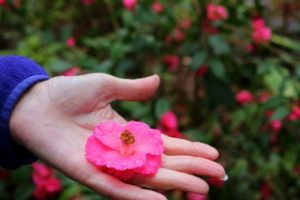 I saw on Phillips’ website a just-introduced pink lavender camellia, the Jennifer Ross, who has been in heaven since 2005. On the web: See more photos with this column at savannahnow.com/accent/columnists. Please join us to weed the garden, clean up winter debris and divide & pot plants in the garden for the plant sale at the Rose Festival on May 4. We will work from 10am to 11am. If you would like to work longer, that would be fine since I usually work until @1pm. A Master Gardener will be available to answer questions and soil sample bags with directions will be available. One thing you can count on is that your dog will want to explore the garden. It’s in his nature and he is fully equipped to inspect (and dissect) every bloom or bud. Unless you plan to install a barrier around the entire garden, you’ll need to focus on dog-safe flowers and edibles. Pesticides don’t discriminate. Certain chemicals, such as 2, 4 dichlorophenoxyacetic acid (also known as Agent Orange, according to Dr. Karen Becker), are in widespread use in popular lawn care products. Unfortunately, this and many other pesticide and herbicide chemicals have been linked to a number of health issues in dogs including canine malignant lymphoma and bladder cancer. Scientific American offers more information on how pesticides affect animals and also provides advice on which pesticides are safe for humans and pets. 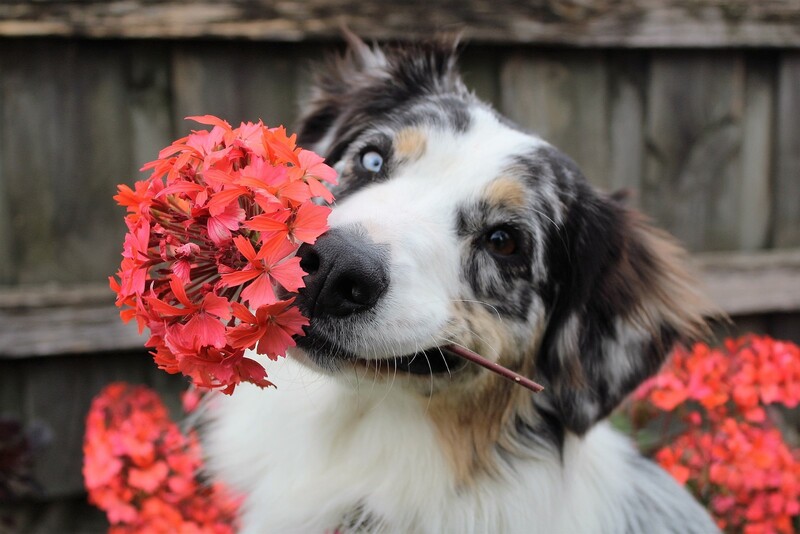 One of the best things you can do for your pet during the spring, summer, and fall, is to allow him access to areas where he can roam free without worry of accidentally ingesting toxic plants or chemicals. There are numerous dog parks throughout most major municipalities. These planned recreational areas will allow your dog to run free, explore, socialize, and burn off pent-up energy so he or she isn’t quite as likely to nose around in your garden. To find the nearest dog park to you, refer to a site like Rover.com, which lists dog parks on a city-by-city basis, such as: Madison, Knoxville, Indianapolis, Albuquerque, San Jose, Portland, Miami, Calgary, Saint Paul and Raleigh. Start training your dog is early as possible to stay away from off-limits areas. If possible, secure your dog on the deck or in another fence-in area while you are planting, weeding, or harvesting in the garden. Make sure to take a time out every half hour or so to play with your pet and keep plenty of toys handy so that he will always have something to do while you’re digging in the dirt. Don’t let the fear of hurting your beloved furry family member stop you from enjoying the bounty of a southern summer. Take preventative measures to keep him – and your garden – safe and always call your vet immediately if you believe your dog has ingested anything he shouldn’t have. Gardening comes with a steep learning curve. Everyone makes mistakes, especially in the beginning. If you want your garden to thrive, jump ahead of the learning curve by learning from the common mistakes of many novice gardeners. Whether you place your bed in an overly-shady area or in one that does not have good drainage, putting your bed in the wrong place can hurt your plants. Try to choose an area that has good drainage and gets at least six hours of sunlight. This will give your garden the best possible chance of survival. Plants grow best when soil has the right pH. Simple soil testing kits can be bought at any home center. A pH of around 6 to 6.5 should work for most vegetable gardens. Also, amend the soil with organic materials like compost to ensure that it has the nutrients it requires. Adding your favorite mulching option is vital to protect the precious soil underneath. If you plant at the wrong time or in the wrong area, your plants may not thrive. Different plants have different needs and will tolerate different things. You should not plant a plant with a long growing season too early or too late. Similarly, if your plants need a long growing season they will likely not be happy in a place like Minnesota. Be sure to check guides online for what will grow best in your area. It may seem simple enough that your plants need water. Not giving them enough water will cause them to wilt and die. Too much water can result in mold or rot. Water at regular intervals and look for signs of a problem. If leaves yellow or dry out, the plant is not getting enough water. If leaves become brown and stems are “mushy,” your plant may be getting too much water. If you start seedlings and do not label them adequately, it can be easy to get them confused. You may be able to tell a tomato plant from a kale plant, but can you tell one type of tomato from the other? Make sure you keep your plants clearly labeled and then keep rows marked once planted in the garden. Mint is a wonderful herb. It smells nice and it's easy to grow. Unfortunately, left unchecked, it will take over. Do a little research before planting. If a plant is known to be invasive, do not plant it. Another option is to plant it in a pot to keep it under control. Seed packages come with instructions for a reason. Trust the experts – the company that produced the seeds – to know when to sow them and how to care for them. Chances are good if you read the directions and follow them, you will not be steered wrong. Pesticides can keep unwanted insects out of your garden. Unfortunately, they can also scare away the useful insects that help your garden. Some insects, like bees, help to pollinate your garden. Instead of pesticides, investigate non-chemical ways to scare away pests, like planting marigolds or inviting other friendly insects. Ladybugs eat aphids who damage plants. Ducks and guinea birds also eat pests without destroying your garden. This might seem like a problem everyone would love to have. If you harvest more vegetables than you can consume or can and give away, they will go to waste. Try starting off small and with vegetables that you know you like. You can always expand next year. If you are new to gardening, you will find you have a lot to learn. Starting with these tips will help you avoid some of the most common frustrations of gardening. Olivia Warfield is a contributing writer and media relations specialist for Distinctive Outdoor Spaces. She writes for a variety of home and garden blogs and strives to learn more each day to cultivate the green spaces in and around her home.